This is an ideal companion to your TMR or grain mixer. It allows you to use TM / VTM concentrate to premix to TM / VTM standard formulas or to create your own custom mixtures. Also great for calf starter mixing! Carries 5' to 8' bales. Adapter available to carry smaller bales. End clamps stay parallel to eliminate "banana" bales. rugged enough to carry more than one bale at a time. 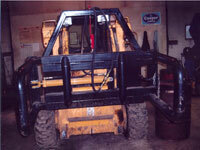 Built with 3 tapered tines designed to slide easily in and out of bales without sliding up through bales. 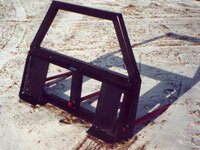 Handles any size square bale. 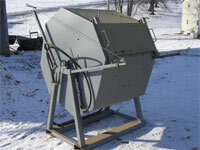 Round bale or combination round / square bale spear also available. These are tools that I think are worthy of consideration in your quest toward minimum tillage. Go to website to locate dealer near you.